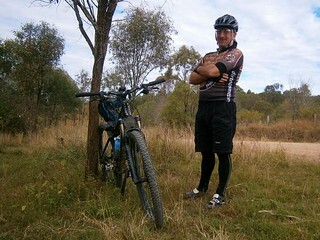 We rode through the Teviot Range today on a big loop through Hardings Paddock, Flinders Plum, Flinders Peak and Undullah. The traditional owners of this area are the Ugarapul Aboriginal people. 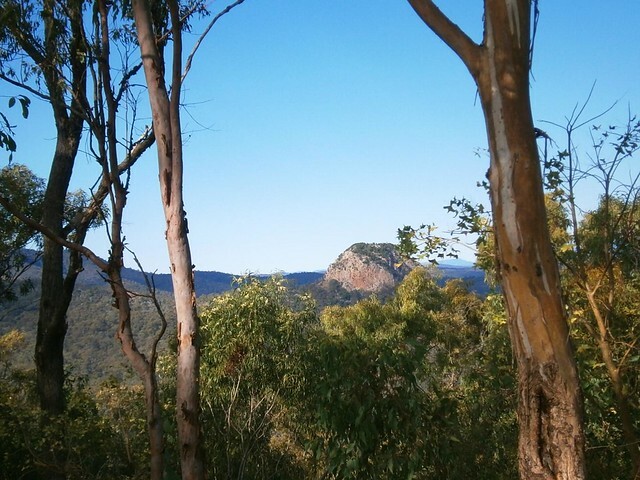 Mount Flinders is sacred to them because they believe that the powerful spirit, “Yurrangpul”, lives there, and guards their traditions and sacred places. His name is similar to the local word for green tree frog: “Yurrang”. The green tree frog is the totem of the Ugarapul people. 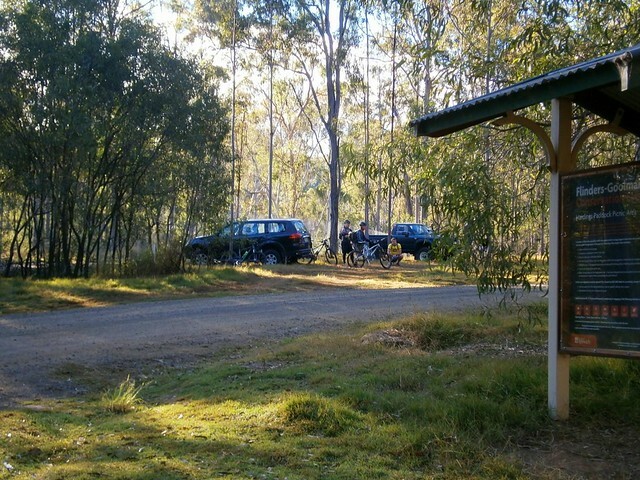 Hardings Paddock is about an hours drive south-west of Brisbane. Not wanting to start our ride too early on a winters morning, we arrived there about 8.30am. 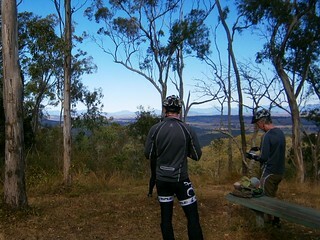 Our first stop was Goolman Lookout which has great views to the south-west as well as back into Brisbane. 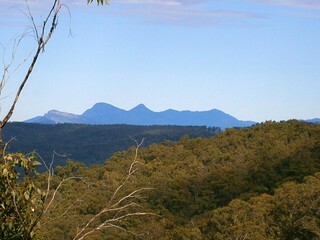 Mount Goolman was originally called “Murdoch Peak” by John Oxley in 1824, but it was later renamed “Goolman” after a local indigenous word meaning “Stone Axe”. 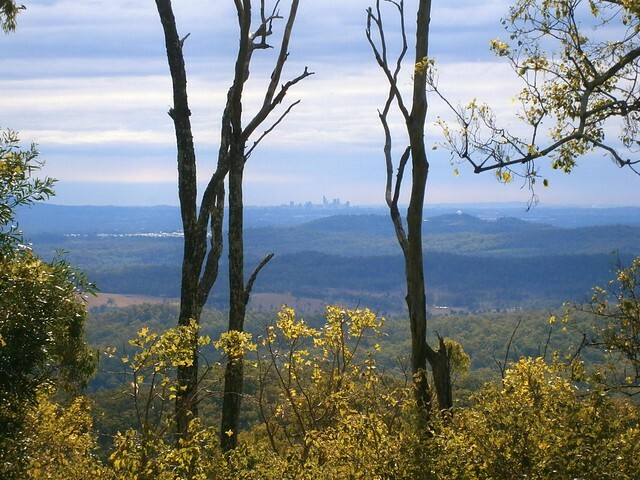 The air was quite clear, and the view to the city in the north-east were amazing. From there we were able to get a good look at Ivorys Rock – a round hill to the south of the lookout. 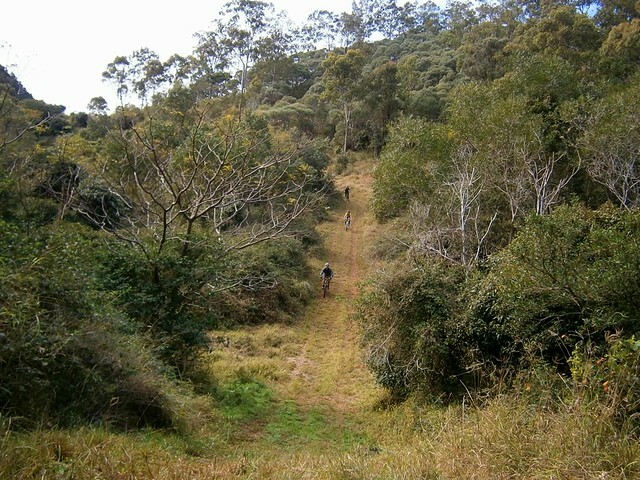 The track from Goolman Lookout to Flinders PLum picnic ground is well maintained and clearly marked. The only problem is that in parts it’s very steep. 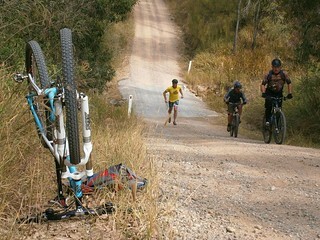 On several occasions we had to get off the bikes and push them up the steep hills. The up-side of this is that we we enjoyed riding down the other side. 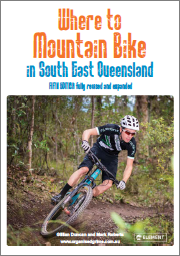 There were warning signs saying “Extreme Caution” before some of the descents, which in mountain biking parlance means it’s going to be a particularly fun ride. Troy’s bike has been lovingly set up for long-distance touring. I am amazed at the distances this man can cover in one day. 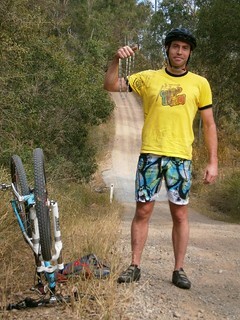 So I thought it was quite ironic that he was the only one who suffered a puncture. The white ball-shaped object on the ground near Troy’s feet is actually an inner tube wrapped in an old sock. Troy says a sock is a much better way of stowing a tube compared to a plastic bag because it offers more protection. The last thing you want when changing a tube is to discover your new tube has a hole in it because you didn’t protect it well enough! After a tough 5km climb across the southern face of Mount Flinders, we eventually made it to the top of Mount Elliott Road, with more amazing views. 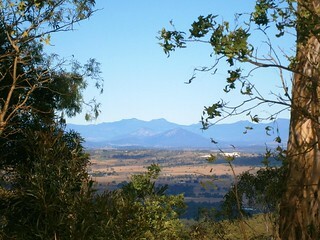 From here you can see all the way to Mount Barney and the Border Ranges. From here it’s also a long descent down to Undullah – so we enjoyed a long white-knuckle descent down the steep gravel road. The bottom of the hill was a great place to chill out, take a break and a bite to eat. 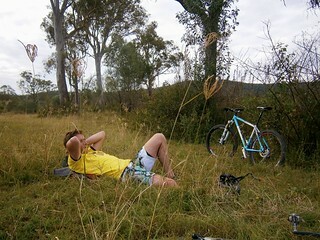 It’s also where we parted company with Troy who continued his epic ride to Kerry, south of Beaudesert. 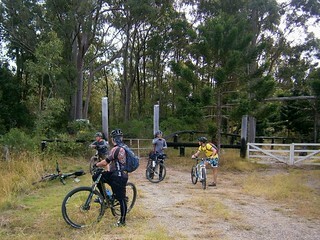 We rode northwards into Ripley before finally turning back towards our starting point. Wards Road offered some more great views of Flinders Peak. 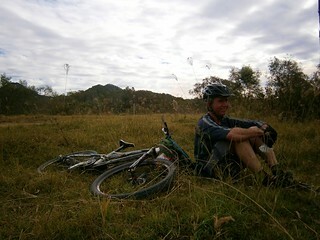 We rode about 50km in about 6 hours including breaks (moving time 4 hours). It included almost 1,700m of ascent. I burned just over 3,200 kcal. 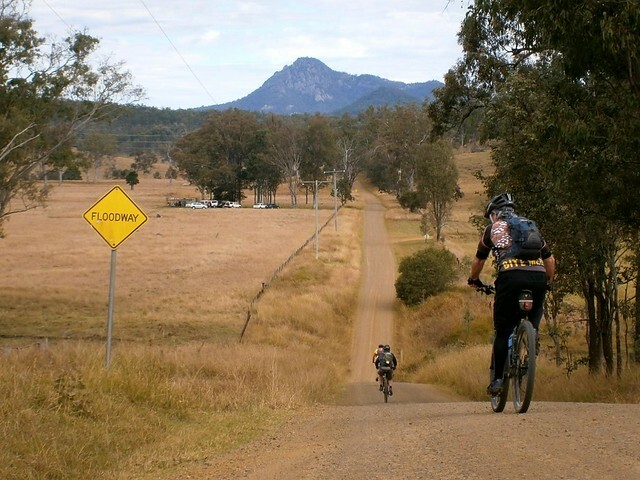 This would be a tough ride in summer or in wet weather. 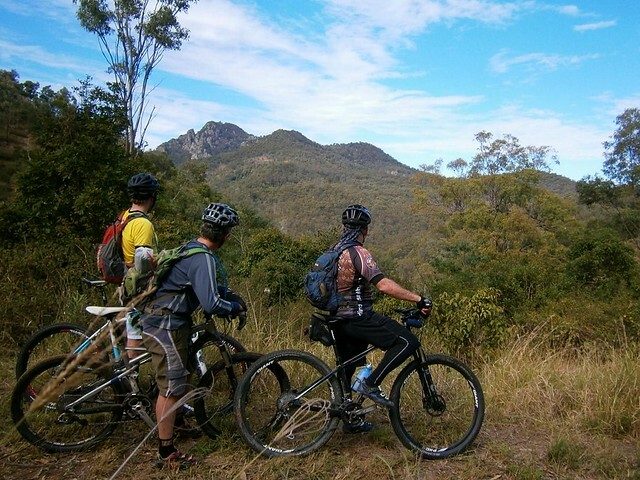 The dry cool weather of Winter is the best time to do this ride. On the tough-o-meter I rate it 8.5 out of 10. As an Ipswich resident, it’s good to see more people getting out there, especially yourself on one of your regular Epics. Thanks Michael. It’s a great part of the world. 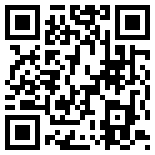 Great photos’ Neil! Looks like it was an awesome day out!